Coding, the process of programming a computer to perform tasks, promotes computational thinking, which helps your child to tackle complex problems by breaking them down into smaller manageable sequences. Even if your child never becomes a professional software engineer or app developer, learning coding is an extremely useful skill to have as its fundamental principles will help them solve problems in almost any subject in school, and in life. The world is becoming more digitally entrenched by the day. To thrive, young children must learn to design, create and express themselves with digital technologies. It is a new literacy that is essential for career pathways in the ever-growing sectors of software development, data analytics, cybersecurity, and robotics. The government also launched the Code@SG movement to nurture interest in technology among young Singaporeans and to continue developing coding and computational thinking as a national capability. It is important to make a distinction between text-based coding and graphics-based coding. Also known as block-based coding, graphics-based coding is a drag-and-drop approach that is used by schools and many enrichment centres as a way to introduce young children to coding. Here at Duino Kids, we believe that text-based coding is the superior approach as it is the basic building blocks of coding used by professional programmers and it has no limitations on creativity unlike graphics-based coding which is dependent on pre-set coding blocks. By learning the proper approach, children will acquire the strong foundation of being able to think through how to arrive at a desired outcome and the discipline to avoid and spot errors in spelling, correct letter casing and formatting, which would render their code unusable. In addition, your child’s ability to touch type will naturally improve as a consequence of working on the keyboard extensively! 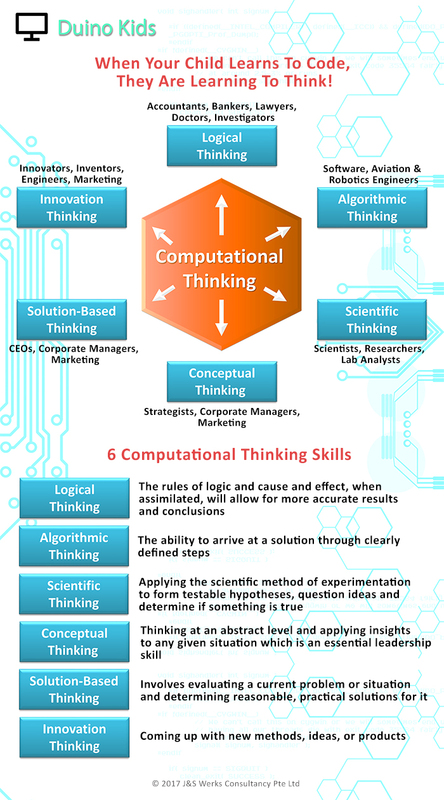 For children in school, four of these computational thinking skills; Logical, Algorithmic, Conceptual and Solution-Based Thinking, will directly aid them in Mathematics. What is more, all six computational thinking skills will enable your child to think through in a disciplined fashion, pay attention to fine detail, avoid making careless mistakes, and apply their creativity to solve complex problems in all their school subjects as well as beyond, in their daily life. Computational thinking skills are transferable and when your child grows up, the skills can be applied across various fields ranging from engineering to finance, legal, marketing, corporate services, and scientific research, amongst many others. Here at Duino Kids, your child will receive individual attention from our expert trainers – we have a low trainer-to-student ratio of 1 : 4. As text-based coding can be an intricate process, our trainers are patient and flexible. Students will be taught how to programme and download codes into the Wink, a 5cm by 5cm micro robot. 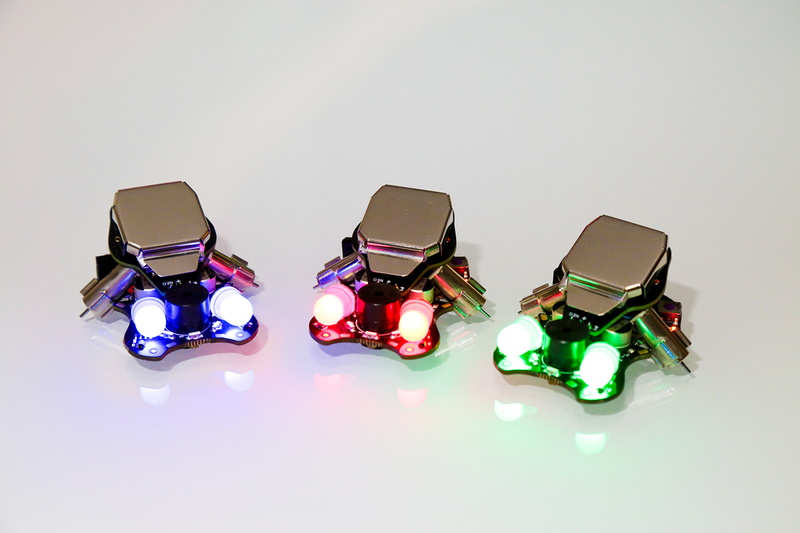 Seeing these micro robots perform tasks in response to their codes is a great thrill for every child! Duino Kids is a fun and interactive coding workshop for children aged 9 and above. It exposes children to text-based coding using the Arduino Integrated Development Environment (IDE). Duino Kids’ workshop is conveniently located at 500 Toa Payoh Lorong 6, HDB Hub #04-40/41, Singapore 310500.